What does a beautiful kitchen look like? Though trends kitchen aesthetics may change, good design is timeless. Homeowners and designers alike consider hardwood a classic kitchen flooring choice. But, hardwood and water aren’t fast friends. When kitchens have hardwood floors, there’s always the potential for damage from spills and scratches. As Americans spend more time than ever preparing food and gathering in kitchens, this means even more opportunities for harm. So, what’s a good option if you want a kitchen floor that’s tough yet warm? Budget-friendly yet stylish? Consider waterproof composite (WPC) flooring, a type of resilient flooring that is new to the market. 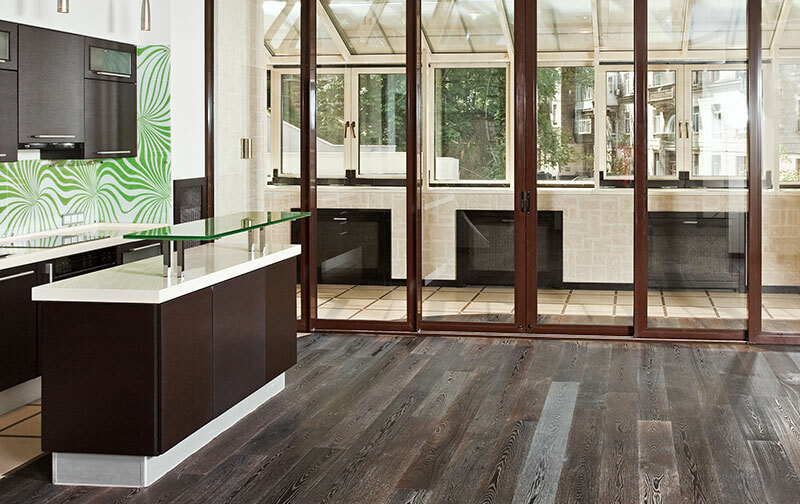 WPC flooring looks and feels like hardwood, and it’s affordable! WPC flooring uses a plank system ant its planks run longer and wider for an attractive, sophisticated look. It also comes in a wide range of colors and textures to give you an elegant, classic hardwood look that is durable and perfect for high traffic areas. Are you worried about potential extra costs during installation? Don’t. WPC flooring snaps together for easy installation. If your kitchen subfloor has imperfections, that’s no problem for WPC flooring. The product’s rigid core can hide them. Once installed, don’t worry about buckling. WPC flooring lays flat and stays flat. WPC flooring is moisture impenetrable. Its interlocking plank technology makes the product completely waterproof meaning water will not penetrate your floor’s surface. Spills and splashes are easy to clean up. They don’t enter the wood, create ugly stains, or damage the subfloor underneath. It does not expand or contract, even when in contact with lots of moisture. Want to learn more about getting the look of hardwood in your kitchen? Stop by the showroom at Kermans Flooring to see samples of WPC flooring. Talk with a design consultant about the best options for your renovation project.